Euan King’s homecoming could hardly have got off to a better start. The netminding recruit is back with Phantoms nine years after last representing his hometown club. King described his return from NIHL Division One South rivals London Racers last week as a ‘no-brainer’ and if his first two performances are anything to go by, it looks a shrewd bit of business from Slava Koulikov. The 28 year-old saved all three Basingstoke efforts to help Phantoms to a 4-3 success after a penalty shoot-out last Saturday and then impressed again in a top-of-the-table league triumph at Bracknell the following night. “I was nervous on Saturday,” admitted King. “But it ws nice to be back out there in front of the Peterborough crowd. “We showed a lot of character from 3-1 down against Basingstoke. A shoot-out is always a lottery. Luckily we managed to put one away and I was able to keep their penalties out. 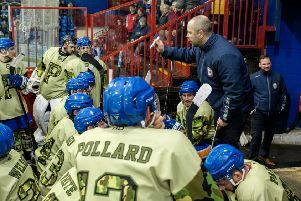 “We didn’t start very well in Bracknell on Sunday and gave up a couple of powerplay goals, but we took over the game in the second and third period and ended up with a comprehensive win. “I didn’t think I would ever get the opportunity to play for Peterborough again. Obviously the change in the league structure has helped to bring it about and as soon as I got the call, it was a no-brainer really. “Playing 10 minutes away from home and having my family all based in Peterborough makes perfect sense. King will hope to continue a pleasing start to his latest Phantoms spell this weekend. The city side go to Sheffield in the NIHL National Cup, Group B on Saturday ahead of a trip to Invicta in NIHL Division One South on Sunday. And there will be sibling rivalry as well as precious points on the line in that clash in Kent. King’s younger brother Damien is first choice between the pipes for Invicta. “I’ve played against him quite a bit over the last few years,” added King. “It’s safe to say we have a bit of healthy competition. “I had the upper hand for a few years when I was playing in Chelmsford, but Damien has had a few wins against my teams lately. I think it’s 8-4 to me when we’ve faced each other and hopefully I can extend that lead on Sunday.